A reader sends word that Hermosa Beach is backing up its commitment to bike safety. 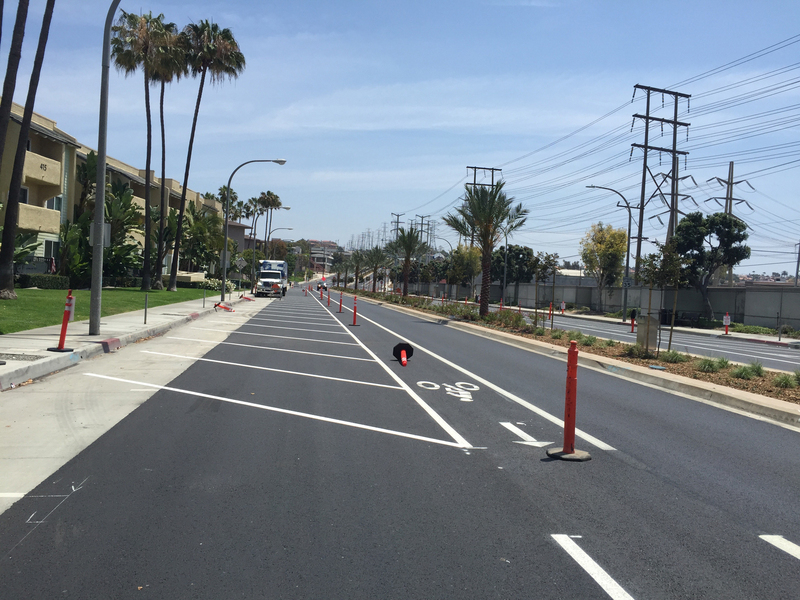 A married couple were exploring the new bikeways on Harbor and Herondo linking Redondo Beach and Hermosa when they came upon some odd markings on the street next to a new bike lane. A quick look online confirmed they are reverse-angled parking spots, designed to improve bike safety by increasing visibility for drivers as they pull out of the spots (scroll down to pages 26-29). Although I neglected to ask just which street they were on. I’m told these could be the first reverse-angle parking in the South Bay. And one of the few anywhere in the LA area. So hats off to Hermosa for reversing the usual risky angled parking to help keep riders safer. Update: A comment from Margaret says the street is Herondo; this is what it used to look like. And Vince points out that the south half the street is actually in Redondo Beach, so they should get credit, as well. Thanks to Margaret for the heads-up and the correction. Philip Young of the San Diego Wheelmen forwards a series of annual reports from the San Diego Medical Examiner examining the causes of deaths in the county for the years 2011 through 2013; he notes the 2014 report hasn’t been released yet. According to Young, the reports show nine bicyclists were killed in San Diego County in 2011, ten in 2012 and seven in 2013. Although my records indicate a higher bicycling fatality rate for each year — twelve in 2011, eleven in 2012 and eight in 2013. I haven’t had a chance to dig through the reports to figure out the reason for the discrepancy yet. However, they may classify bicycling fatalities more conservatively than my records; I include anyone who was riding or walking a bike at the time of their death, including solo falls and bike-related medical conditions, as well as traffic collisions. Update: Ed Ryder sends word that SWITRS shows 15 bicycling fatalities in 2011, which makes more sense. I track fatalities primarily through news reports, as well as other sources, so my records may undercount the actual totals if the death of a cyclist never makes the news; that often happens if the victim dies several days or weeks after a collision. The real question is, why does the Medical Examiner’s report undercount bicycling fatalities for that year by over 50 percent? The Women’s Tour of Britain is helping to bridge the equality gap in pro cycling, while a writer for Britain’s Guardian says it’s time for cycling to lose the podium girls. Let alone bikini girls at women’s races. Twenty-three-year old Astana women’s pro Anna Solovey has been canned by the team for “unprofessional behavior;” she was previously banned for two years for doping before she was even in her 20s. And you’d think someone who once sponsored a major bike race would get that 72 years old isn’t too old to race, let alone ride. Thanks to Megan Lynch for the link. A Metro survey shows 37% of LA voters think separated bike paths are very important, while only 10% say they’re not important at all. Pasadena gets that intersections are dangerous places for bike riders; the city is painting a new bike lane that remains green all the way through the intersection of Marengo and Orange Grove. CiclaValley tells you why to get excited about the upcoming LA River Ride, set to roll on the 28th. 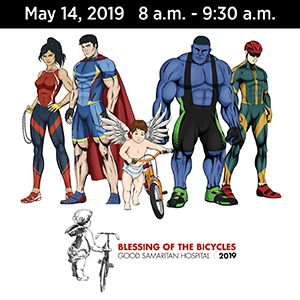 And if you’re not too worn out from the River Ride, join CICLE, the Bike Oven and Metro for the Spintacular Fireworks Neighborhood Ride later that day. Dozens of Santa Ana homes will be demolished to widen a dangerous Santa Ana street, including wider medians and sidewalks. And yes, bike lanes. I guess performing a road diet and keeping the houses would be out of the question in auto-centric OC. Oceanside police will team up to compete in RAAM; the team competition starts on Saturday. A San Diego County supervisor may have committed an ethics violation in nixing a bike lane that could have affected the value of a restaurant he’s a partner in. Although as a new study shows, he may have shot himself in the foot. Coachella Valley bike riders are urged to donate old bikes, locks and helmets to benefit the local Boys and Girls Clubs. A writer for People for Bikes says you don’t have to give up your car to live mostly car-free. I’ve put less than three hundred miles a year on mine for the last five years. Someone is groping and harassing women riding on Phoenix bike paths; one woman was punched in the face by a homeless man. Boulder CO moves forward with right sizing three major streets to make room for wider bike lanes. A Chicago runner and firefighter makes a commitment not to use his cell phone when he drives. Don’t believe everything your GPS tells you. A Minnesota girl learned that the hard way after her smartphone guided her and her bike onto a freeway. Evidently, it takes concrete barriers to keep New York drivers from parking in bike lanes, green or otherwise. Maybe we could use some here to keep cops out. Bike commuting in the DC area jumped 450 percent in just three years, while auto commuting has remained steady; now another area county plans to ramp up their bike network. Twelve reasons why you should take a foldie when you explore Cuba. Which is sort of legal for Americans these days. Visiting Cuba, that is. A group of 17 friends will team together to finish the epic ride a UK man had planned before he was killed in a collision earlier this year. A British woman can ride a bike for the first time after being fitted with the world’s most lifelike bionic hand. An Irish mom says yes, cyclists face dangers on the roads, but pedestrians run a risk from us, as well. Tim Robbins casually rides a bike in Milan. Just don’t ask him about The Shawshank Redemption. Bollywood star Shah Rukh Khan is riding his new bicycle on his Bulgarian set as he recovers from knee surgery. Reckless Japanese bike riders can now be required to take safety lessons, and can face steep financial liability for injuring others. Caught on video: Eating behind the wheel is one thing; eating cereal out of a bowl is another. Eight years old may be just a tad too young for a naked Brit bike ride, by about a decade or so. And when your name is Outlaw, it’s probably not a good idea to steal a bike, unlocked or otherwise. Somehow, I missed this last week. The Los Angeles County Bicycle Coalition reports on a new plan by transportation planner Ryan Snyder for bike lanes on Westwood Blvd. The Remove Nothing Plan would do exactly that, focusing on narrowing traffic lanes to make room for bike lanes and sharrows without removing a single traffic lane or parking spot. While I’m not a big fan of sharrows, the green-backed variety should get attention from the too often distracted and otherwise unaccommodating motorists that ply that busy street, and help keep riders from having to fight for a modicum of space like they do now. And sharrows are only used in the section that’s too narrow to accommodate bike lanes given the restriction to remove nothing. Although whether that will be enough to win the approval of the wealthy homeowners who got CD5 Councilmember Paul Koretz to break his word and shoot down the last plan remains to be seen. Meanwhile, I’m told Koretz called on LADOT to find an alternative route for cyclists that doesn’t involve Westwood at a recent meeting of the Transportation Committee — neglecting to consider that every other alternative has already been considered and rejected. Unless maybe he wants to put a bike lane on the shoulder of the 405. In a move reminiscent of Ronald Reagan’s famous plea to Mr. Gorbachev, Redondo Beach officials tear down the wall separating Redondo from Hermosa Beach to make room for a two-way cycle track on Harbor Drive. 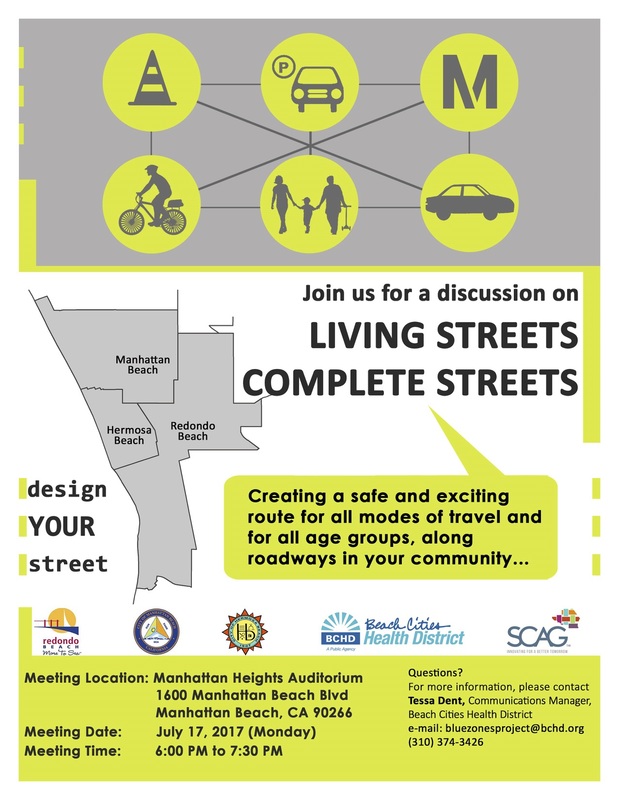 Plans also call for sharrows on northbound Harbor that will connect with the existing sharrows on Hermosa Ave, so riders won’t be forced to ride on the wrong side if they’re not planning to take the Strand through Hermosa Beach, where bikes are limited to 10 mph. Thanks to Jim Lyle for the heads-up and research on the sharrows. Fig4All calls for closing the gaps in bikeways that almost but don’t quite connect South Pasadena with Northeast LA. Pasadena’s city council votes to end the outdated, auto-centric Level of Service standard for measuring traffic efficiency, which emphasizes moving cars over people. Which, oddly, is exactly what often happens. Santa Monica considers its own 500-bike bike share system. And that’s exactly what I’ve been afraid of; if each city in the LA metro area develops their own bike share, we’ll end up with a mismatched and incompatible series of networks that won’t allow users to ride from one city to another. The 10th annual Tour de Foothills rolls in Claremont this Saturday, with rides ranging from 33 to 100 miles. California’s High Speed Rail Authority reaches out to Calbike for suggestions on how to integrate bikes into the planned rail system. A CHP Public Information Officer says the law prohibiting crossing a double yellow line may not be a hard fast rule when it comes to passing cyclists with a three-foot margin; as usual, bike lawyer Bob Mionske gets it right — including his observations on the current state of California politics. San Diego’s third CicloSDias takes place this Sunday. A Murrieta motorist hits the crappy driver trifecta — driving under the influence while simultaneously eating and using his cellphone — when he hit a cyclist, sending the rider to the hospital with critical injuries. Thanks to Zak for the heads-up. The Governing website looks at why bike groups lashed out at the recent governors’ bike safety report, and still misses the mark; what’s missing from the discussion is that bike helmets are a last-ditch safety measure when everything else has failed, not the first line of defense. Turns out Car Talk host Tom Magliozzi, who passed away on Monday, was one of us. Bike Portland’s Jonathan Maus has his bike stolen, but steals it back the same day. And discovers an open air bike theft chop shop in the process. 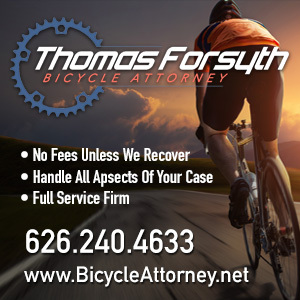 Ohio bike lawyer Steve Magas looks at insurance issues for today’s cyclists, including the fact that homeowners or renters insurance should cover you for liability damage while riding your bike. And warns you against auto coverage from Nationwide, which evidently is not on your side if you’re on a bike. Boston requires trucks to have side guard panels to protect cyclists, something that should be mandatory nationwide. New York Streetsblog questions why the NYPD is defending hit-and-run drivers in the press. Damn good question. Bike Biz wants your nominations for the Top 50 Women in Cycling. The Mirror wonders why it’s so hard to prove helmets make cycling safer, while a writer for the Telegraph bizarrely insists that more and better bike lanes are not the answer because not everyone wants to bike everywhere, cycling in the UK is safe enough already, and England will never be Holland and bloody well doesn’t want to be. Italian great Marco Pantani’s body may be exhumed as suspicion grows that he was murdered by mobsters. Caught on video: The five best road bike descents. Once again, a newspaper asks if you can look stylish as you ride to work, this time in Australia. And once again, there wouldn’t be a story if the answer was no. CNN applauds Bangkok’s airport bike path. Cycling in the South Bay’s Seth Davidson schools a ride newbie, then discovers he’s America’s top track Olympian; not Seth, the newbie. Salt Lake City police look for a knife wielding, sidewalk raging cyclist. And despite the headline, even the best lights don’t really create a force field around your bike, unfortunately. A national organization honors the Best Complete Streets Policies of 2012. According to a press release from Smart Growth America, three of the top 10 policies are from cities in the greater L.A. area — though they define that as a far greater area than anyone here would. They list Hermosa Beach and Huntington Park tying for second behind Indianapolis, with Rancho Cucamonga in 10th place. I think San Bernardino County would dispute that it’s anywhere near L.A. And I’m not sure L.A. would admit to more than a passing acquaintance it. According to the SGA website, 488 cities and towns nationwide have adopted Complete Streets policies. There may be hope for this country yet. Update: I initially wrote that Orange County’s Huntington Beach received the honor, rather than L.A. County’s Huntington Park. Thanks to TQ for the correction. California’s latest proposed three-foot law is amended to address the improbable concerns of our veto-wielding governor. Can’t say I’m familiar with the bill’s sponsor, Assemblymember Steven Bradford, but I’m liking the guy more and more each time I read about this bill. Here’s who you need to bug before April 22nd to get the bill out of committee. But will Ohio get theirs before we get ours? Depends a lot on Governor Brown and his veto pen. The Antelope Valley Times offers a detailed update on the two idiots — and I use the term advisedly — who intentionally Jerry Browned a group of cyclists on Sunday morning, as we discussed here yesterday. Idiot one is being held on $100,000 bail, while idiot two was released on $30,000. Thanks to Michele Chavez for the link. 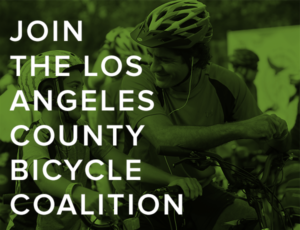 The authors of Where to Bike Los Angeles will team with the LACBC for L.A. Roubaix, our own not-so-hellish cobblestone-equivalent ride this Sunday; I’m told participants may have an opportunity or two to join in on Sunday’s Rowena Ave Cash Mob, as well. Will pedestrian improvements make Downtown’s freeway overpasses more walkable? A petition calls for completion of the planned Confluence Park and its connecting bikeways. Santa Monica students go car free. Time for a little beer-induced bike-centric socializing in Upland. Calabasas bike-centric eatery Pedalers Fork is looking damn good, even if we have to wait until the 22nd for it to open. Long Beach police are on the lookout for a bike-borne groper, who evidently owns, steals or borrows multiple bicycles. Signal Hill wants to hook up with Long Beach, bike lane-wise. A visit to frame building school, in two parts. Velodrome season opens in San Diego on Wednesday. San Diego needs to work with SANDAG to develop a regional bicycling plan. San Francisco Streetsblog discusses raised bike lanes to separate bikes from taxis; they’re coming to Chicago, too. A 12-year old Oakland thief is arrested after attempting to make his getaway by bike. Santa Rosa is the latest city to consider a cyclist anti-harassment ordinance. A Novato bike shop gets the okay to sell beer to its customers; now that’s what I call full-service. A Vacaville cyclist is recovering after being seriously injured riding salmon. The late Annette Funicello was 1958’s Bicycle Queen, while Stephen Colbert wipes out on a pink cruiser in the House office building. A Great White North news site challenges Lance to earn back a little respect by competing in the Iditarod Trail Invitational bike race through the Alaskan wilderness — in winter; or he could just sponsor my brother so he doesn’t have to sell his entire dog team and equipment, damn it. An OKC cyclist is looking for the hit-and-run motorist who gave him fifty bucks, then drove off. New York’s long-delayed bike share program will kick off next month; Gothamist offers a first look at a new station in Brooklyn. New York cyclists push for bike lanes on the famed Verranzano Bridge. A Brooklyn cyclist is billed $1,200 for damage to the NYPD patrol car that hit him. A Daytona Beach mother is killed riding on her way to a job interview. A Pensacola man gets 24 years for killing a cyclist in a hit-and-run six months after getting out of prison on a DUI. Miami Heat stars LaBron James and Dwayne Wade support the city’s Critical Mass. A Vancouver cyclist is killed in a collision with a pedestrian; when bicyclists collide with pedestrians or other bike riders, it can be deadly for both victims. After the latest London bike death, cyclists call for a ban on large trucks at rush hour. London Cyclist explains why drivers get mad at us, and offers slang you need to know. A UK writer points out the first death from performance enhancing drugs occurred in 1886; not surprisingly, the victim was a cyclist. Georgian President Mikhail Saakashvili breaks his shoulder riding his bike in Turkey. Finally, all the hot vampires and werewolves from Twilight recommend using bike lights so you won’t end up undead like them; or am I reading a tad too much into it? Perez Hilton loves this bike. And it turns out Niceville isn’t for at least one pedestrian and bike rider. In search of the Great White Sharrow. Last week, I found out exactly where the door zone is. Not that I didn’t know before. Though now I doubt I’ll ever question it again. Last month I mentioned that I’d ended up riding the now nearly four week-old sharrows on 4th Street the day they first appeared. And found them not quite to my liking, placing me a little further out into the lane than I felt comfortable with. After reading that, Gary Kavanagh reminded me about the sharrows that had been placed on Hermosa Avenue in Hermosa Beach since I’d last been down that way. So I set off to check them out, plotting a route that would take me to the Redondo Pier, then back up to check out Santa Monica’s newly extended bike lanes on Arizona Ave and the new sharrows on 14th Street. And figured I might as well visit the site of the soon-to-come sharrows on Abbot Kinney Blvd in Venice while I was at it. Call it my own personal Tour de Sharrows. As I rode up Abbot Kinney, I took my usual position just inside the lane and just outside the door zone. A short line of cars passed safely around me, moving across the yellow line to leave a comfortable margin of three to five feet. All except the last car in the line, which failed to follow the example the others had set — and instead buzzed me less than a foot from my left elbow. At that exact moment, as a car zoomed by just inches to my left, a driver unlocked his parked car and — without ever gazing behind him — threw open his door, missing me by just inches. That’s when the real meaning of door zone sank in. If I’d positioned myself even a few inches to the right, I would have been knocked into the car on my left. And where I would have pinballed from there I have no idea. And no desire to find out. But it reconfirmed my own instincts, and provided exactly the experience I needed evaluate the sharrows for myself. When I made it to Hermosa, I paused to take a couple of quick photos. And watched as the drivers zoomed down the street jockeying for position on a busy beach day — despite what it looks like in the photo below — and convincing me that I would have to struggle to hold my lane position. Sharrows or not. Yet my experience was exactly the opposite. The start of the Hermosa sharrows, which extend down Hermosa Ave from the bike path. The sharrows were positioned dead center in the right lane, just as they’d been on 4th Street. But here they were on a four lane street, rather than two. And as I rode down the center of the lane, drivers either followed patiently behind me, or simply moved into the other lane to go around me. No one honked. No one pressured me or passed too close. And the only driver who followed closer than I liked went around me once he realized I wasn’t going to get out of his way. In other words, it was probably the most enjoyable experience I’d ever had taking the lane. I can’t say I felt that way in Santa Monica. When is a bike lane not a bike lane? When it's a work zone in Santa Monica. First up was the bike lane on Arizona, in which I rode safely for exactly one block before being forced into the traffic lane by a city work crew. So I took my place in the lane, riding squarely down the middle and holding my place in a line cars until I could move safely back into the bike lane and leave them in my lurch. As I was for the light to change, I noticed not everyone in Santa Monica like bikes. When I got to 14th Street, I turned left and resumed my usual place just outside the door zone. For the first few blocks, the lane was wide enough that cars could pass easily on my left. Once it narrowed, I moved a little further into the lane, yet still far enough to the right that drivers could pass with just a little patience by briefly moving onto the other side of the road. That ended once the sharrows started. Just as on Hermosa Avenue, the sharrows were placed directly in the middle of the traffic lane. But here it was on a two lane street, where drivers would be forced to go all the way onto the other side of the road to go around me. The drivers behind me clearly had no intention of doing that. And I can’t say I blamed them. So after awhile, I ignored the markings on the asphalt, and moved back to where I felt more comfortable on the right third of the lane — allowing the drivers behind to go around by briefly crossing over the center of the road, much to their relief. And mine. It was then that I discovered my own personal sharrow comfort level. UCLA's sharrows are placed in the right third of the traffic lane. On roads with two lanes in each direction, I’m perfectly comfortable in the center of the lane, where anyone who wants to pass can simply take the other lane. I don’t have to worry about impatient drivers behind me, or feel like I’m not sharing the road myself. Even though I’m quite comfortable riding in the center of the lane for short distances or when I’m moving at or near the speed of traffic, I prefer sharrows placed on the right third of the lane when there’s just one lane in each direction. Like the ones that I’ve used when riding through the UCLA campus the past few years. This marking either means that a sharrow goes here, or your money went that way. And judging by the placement markings that recently appeared on the street, exactly where it looks like LADOT is planning to place them on Westholme Ave. It may not be the placement preferred by everyone. But it keeps me out of the door zone while putting me in control of the lane — without blocking it completely. And it’s the one I’m most comfortable with. My grandfather was one of the last of the old time mountain men. A former Doughboy, he fought the Kaiser in France (that was the war before the war Tom Hanks won — the one that was supposed to end all wars). And even in his 60s, he still earned his living off the land. He’d disappear for a few days, or a few weeks, and come back home with a deer or elk to feed his family; if hunting had been good, he might have a few more to sell to the local butcher. Or maybe he’d have a truck full of logs to sell to the sawmill, or a some pelts he could trade for things he needed. He was a gruff old man, without a lot of patience for a little kid like me; still, he taught me that the wilderness had countless stories to tell if you just knew how to read the signs. Like how to tell if a set of cat tracks were from a harmless bobcat or a more dangerous cougar, and whether it was on the prowl or just passing through, and how to examine the tracks to see it was old news, or if they were fresh and there was a potentially dangerous animal lurking about. Granddad taught me how to spot a tuft of fur stuck to a tree where a bear had tried to scratch his back, and tell whether it was from a black bear or a grizzly bear. And how to spot the odd semi-swirling marks, like one half of a parentheses on top of another, that indicated a snake had recently passed by, and look for the tell-tale markings that could identify it as a rattlesnake. He wasn’t my real grandfather; not by blood, anyway. He was just the man who married a pretty widow, whose husband had drowned shortly after they’d moved to that small Colorado town, leaving her with two small children to raise — one of them my mom. But my other grandfather, my Dad’s father, had run off when he was just a boy, so he was the only one I ever had. He died when I was just 12 years old, after a long, miserable battle with emphysema — just one of the many reasons I hate cigarettes. So I must have been very small when he taught me those things. But they stayed with me; even now, I find myself using those skills as I ride the streets and bikeways of L.A.
Like if I find myself riding through an area I’m not familiar with, I keep an eye on the local graffiti to see if it’s just the usual taggers, or possibly a sign of gang territory that warns me to be careful. Or I read the intersections, looking for warning signs. Like remnants of wreckage in the roadway on yesterday’s ride, such as the twisted pile of rubber and glass that indicated a recent collision in Brentwood, and marked it as an intersection where I should be a little more cautious. Then there was the set of nearly intersecting skid marks that told the story of a car entering from a side street, and slamming on the brakes to avoid another vehicle — in this case, a road bike, judging by the narrow marks it left as it skidded to a stop. But there was no broken glass, and the two sets of skid marks ended just far enough apart to suggest a happy outcome this time. There were other signs, as well, such as the pile of broken glass next to an empty parking space, suggesting that someone lost their car stereo — or perhaps their car — the night before. And the used condom left in the gutter nearby implied that thieves weren’t the only ones active in the night. Some signs are more obvious, though. Like the relative emptiness on the beachfront bike path, that told me the tourists are gone for this year. Or most of them, anyway; the small group of biking Deutschlanders I gave directions to offered proof that there are still a few left exploring our fair city. The nearly deserted plaza in Hermosa Beach, which only a few weeks earlier was jammed with young men and women in board shorts and bikinis, told me that school was back in session, and another L.A. summer is nearly over. And the snapping of the wind-driven flags over the pier, pointing away from my destination, told me it was going to be a hard ride home. VeloNews says Lance could be making a comeback. 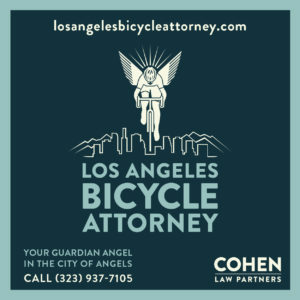 Gary reminds us that most rides are uneventful, while Bike Girl challenges her councilmember to join her for a ride over the Cahuenga Pass. Will Campbell rides with the original Midnight Ridah, and No Whip describes his recent Pennsylvania fat tire tour, complete with snakes and skinny dipping. Streetsblog announces a new Livable Streets Group to try to reclaim the Ballona Creek Bike Path. Just Williams comments on the lack of summer in the U.K. and prepares for wet rides, then is surprised with a sunny day. I’m really not a fan of bicycling in Los Angeles. Sure, I ride here, because this is where I live. But of all the places I’ve tried to ride, this town ranks pretty near the bottom. The only place I’d rank lower was Baton Rouge, LA, where I could count on getting run off the road or doored every time the frat boys at LSU had a few too many. Which was pretty much every weekend, now that I think about it. But there are days that make it all worthwhile. Like the other day, when I took a quick run down the coast to cool off from an early season heat wave. It was just early enough in the day to beat the crowds that usually clog the beachfront bike as the day goes on, and the weather at the beach was perfect. I was feeling good, so I just kept going, past sailboats and surfers, seagulls and sun-drenched beach babes tanning on the shore. After about 25 miles, it was time to turn around, so I stopped briefly in Hermosa Beach to tighten a spoke and eat one of the Kashi bars I keep in my seat bag. And in that short amount of time, a heavy fog rolled in, blanketing the coast and completely changing the texture of my return. Instead of clear, sparkling views, I passed through a heavy grey curtain, hiding all my landmarks and parting only briefly to unveil a building or allow another rider to pass by. As I rode, I could see breakers come out of nowhere, sometimes bearing a surfer floating out of the haze. The result was a sense of splendid isolation, as if I was somehow cut off from the world, and every person and object I passed was a welcome revelation. Of course, it’s one thing to savor a fog like that on an isolated bike path; quite another to slog through traffic when you can’t see where the cars are coming from. But within a few blocks of the beach, the fog — and that magical feeling — melted away.